Check Alive service task — the Check Status Task can be triggered if the IP-device fails to answer on the Check Alive service request. Recovery Procedure tasks — when NVR loses connection to an IP-device it is scheduled to record, it enters into a recovery procedure. Tasks can be executed at different points within the procedure. Task on First Error can be triggered when NVR first loses connection; Task on Recovery Procedure Failure — initiates if all the attempts of recovery procedure have failed; Task on Restore initiates in case the IP-device comes back online. 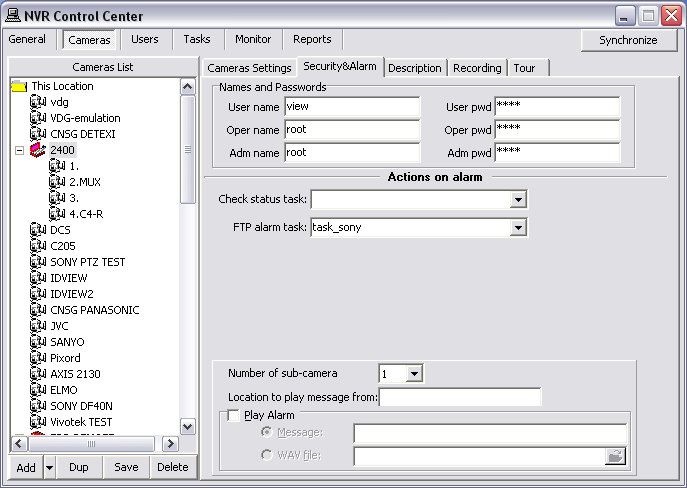 FTP Alarm— in some wireless configurations, and other environments where constant streaming is not possible, video can be uploaded via FTP based on decision making within the IP-device. When video is uploaded to the DETEXI NVR FTP Server, the video is merged into the archives as alarm video, and this event is raised. Input Alarm — if an IP-device supports external I/O, the Check Alarm (IO Listener) service can monitor the status of the camera’s inputs. This event is raised when an IP-device’s defined input is in an active (non-normal) state. A separate event is raised for each IP-device input that has this feature enabled. Soft Motion Alarm — when motion detection is enabled in the IP-device recording schedule, an event is raised each time motion is detected on an IP-device by the DETEXI software. A separate event is raised for each IP-device recording schedule if Alarm on Motion is configured. An event can also have a composite task assigned to it. Any composite task consist of several predefined tasks of the user’s choice. The DETEXI NVR streaming and records video information from the IP-cameras/video servers, which are complex devices by themselves and can often be the source of problems. Using a Check Alive service — the Check Status Task can be triggered if the IP-device fails to answer on the Check Alive service request. 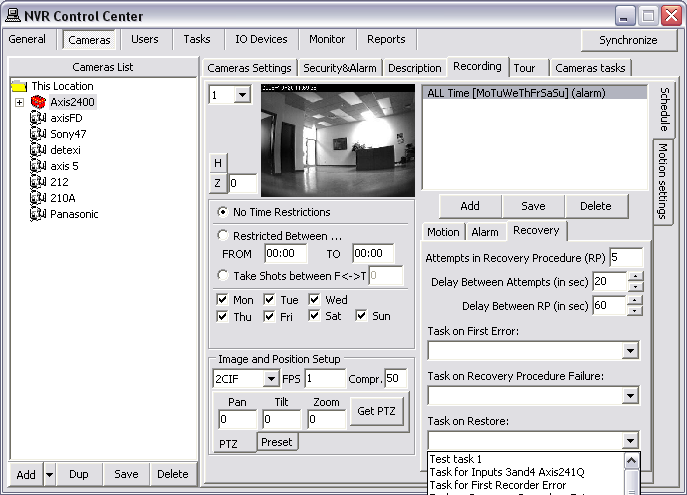 Using a Recovery Procedure in the IP-device Recording Schedule — when NVR loses connection to a camera it is scheduled to record, it enters into a recovery procedure. Tasks can be executed at different points within the procedure. Task on First Error can be triggered when NVR first loses connection; Task on Recovery Procedure Failure — initiates if all the attempts of recovery procedure have failed; Task on Restore initiates in case the IP-device comes back online. The Check Alive program is relatively heavy on NVR resources and it should be used only in the case of recording on I/O ports when the recorder is off and starts to record when the signal from I/O port is received. 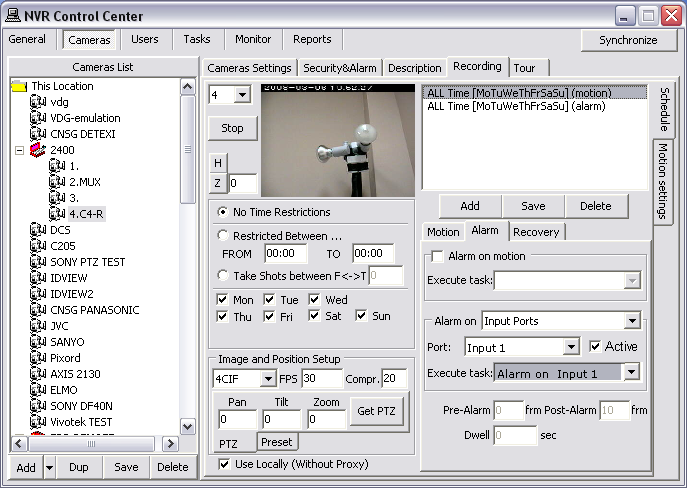 In the NVR Control Center — Cameras select a camera from the Cameras List. Switch to the Security & Alarm. Under the Actions on alarm select an appropriate predefined task from the Check status task drop-down list. Task initiates if the IP-device fails to answer on Check Alive request. 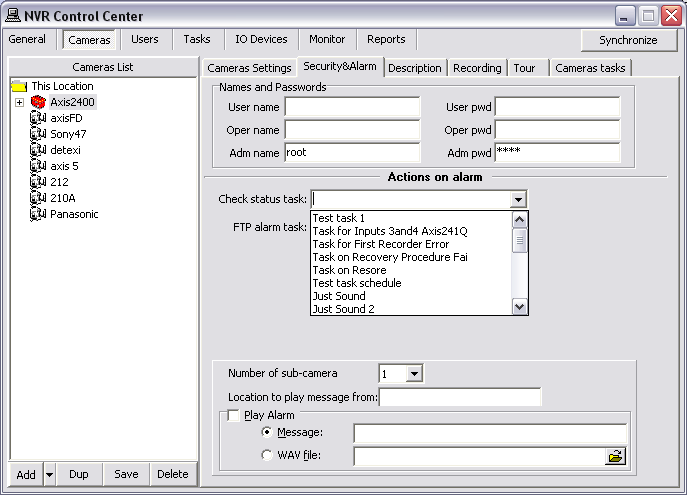 Repeat steps 1-3 for any camera from the Cameras List to setup actions on alarm task. It must be clear for you that if a device fails to answer this does not necessarily mean that there is a physical device failure. It could be a connection (network) error. From the NVR reliability point of view it is irrelevant as to why there is no video stream but from the point of view of the technician (who has to fix the problem) there is a big difference. Another method to deal with IP-devices errors is to setup Recovery Procedure inside a camera Recording Schedule. The Recovery Procedure fully describes how the Recorder will deal with the faulty camera. Choose a camera from the Cameras List. Switch to the side Schedule tab and select an item from the Schedule list to update an existing schedule settings or press Add button below the Schedule panel to create a NEW schedule. Task on Restore — (if assigned) task initiates in case the IP-device comes back online. Press Save button below the Schedule panel. Repeat steps 3 - 6 for the other schedules. Setting up a Recovery Procedure for many cameras with complicated recording schedules could be time consuming. To make it easier use the Recorder Recovery Settings Template. According to the recommended settings the Recorder initiates the Task on First Error when the video stream failure occurs. Than makes up to 5 attempts with 30s interval to recover the stream. If any of the attempts succeeds the Task on Restore notification / action will be initiated; if not — the next round of attempts to connect to the faulty camera starts in 10min (600s). Setting up a Recovery Procedure for many cameras with complicated recording schedules could be time consuming. To make it easier a template enforcing particular settings in a newly created schedule can be created. In the NVR Control Center go to the General — Advanced. The Recovery Procedure settings from this template will be forced in to each newly created cameras recording schedule and could be changed. Under the Actions on Alarm select an appropriate predefined task from the FTP Alarm Task drop-down list. Click Save button below the Cameras List to save settings. IP-device Input Alarm executes task on hard motion detection, when an external motion detector is connected to the IP-device input. 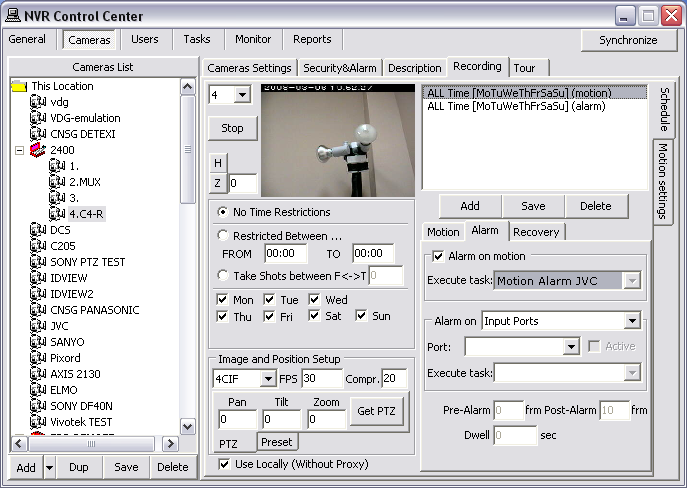 If a camera supports external I/O, the Check Alarm (IO Listener) service can monitor the status of the camera’s inputs. Input Alarm event is raised when an IP-device defined input is in an active (non-normal) state. A separate event is raised for each IP-device input that has this feature enabled. Select a schedule from the Schedule list and switch to the Alarm tag below the Schedule list. Select Input Ports from the Alarm on drop down list and specific input port from the Port drop down list. Check Active checkbox — the Execute task drop down list activates — select a predefined task from the list. Click Save button below the Schedule list to save settings. The IP-device Input Alarm applies to hard motion sensing (triggered by an external motion detector) only. For soft motion sensing (residing in the software) the IP-device Soft Motion Alarm should be configured. When motion detection is enabled in the IP-device recording schedule, the Soft Motion Alarm is raised each time motion is detected on an IP-device by the DETEXI software. A separate event is raised for each IP-device recording schedule if Alarm on Motion is configured. Switch to the Recording . Check Alarm on Motion checkbox to activate the Execute task drop down list and select a predefined task from the list. The IP-device Soft Motion Alarm applies to soft motion sensing (residing in the software) only. For hard motion sensing (triggered by an external motion detector) the IP-device Input Alarm should be configured.